Ron Yates has been learning to write for most of his life. He whipped out good essays in high school, but his adolescent energies were largely devoted to tinkering with old cars, drag racing, drinking beer, and trying to stay out of trouble. Although encouraged by his English teachers to pursue higher education, Yates, after graduating high school in lackluster fashion, spent time languishing in factory jobs. An aching back and a caring girlfriend prompted him to explore other options. His enduring love of reading and nascent knack for writing guided him to a degree in English and a career teaching high school. Years later he earned an MFA in creative writing from Queens University of Charlotte. Yates, who lives near Mt. Cheaha on the shore of beautiful Lake Wedowee, has published stories in a variety of journals including Hemingway Shorts, KYSO Flash, Still: the Journal, The Oddville Press, and Prime Number Magazine. He has a son and daughter and is married to his sweetheart, Carol Yates. Make It Right by Ron Yates is a novella and a series of eight short stories. These stories chronicle the despair of people who make the wrong choices, bad choices that have negative effects on others. An English teacher, lonely and hating himself; an orphan with no place to call home, on the cusp of manhood; a factory worker who can't seem to stop himself turning violent; disturbed teenagers and more. Every story will tell you how they went bad, how they caused destruction and havoc among friends, family, and complete strangers. Of how they made it right. Make It Right: A Novella and Eight Stories by Ron Yates is an interesting look at the harsh realities of life. The characters may be fictional but we all know at least one of them, maybe more, and every story is realistic and believable. Trouble comes in all shapes and sizes and Ron has covered some of these troubles eloquently. His style of writing is straightforward, descriptive, and leaves no doubt as to what he is trying to convey. He made his characters into people we could all identify with and there is truth in every story, along with plenty of drama. He takes us on a journey we may never want to repeat, a view of the bad side of life, a path that some will, sadly, continue along. Others will find it in their hearts to see what they are doing and turn things around, to make it right as Ron says. Although there are some scenes of a sexual nature, I believe that this book is suitable for young adults upwards; for some, they may see themselves in time to stop what they are doing; for others, it’s a lesson to be learned – don’t go down that route. In Make It Right, Ron Yates presents us with eight short stories along with a novella. Each offering can be read on its own, and is obviously intended to stand by itself. There are no recurring characters and no shared locales. This is hard to determine for sure, because each story takes place somewhere in the south and locations aren't necessarily defined. Though it doesn't really matter, as these are universal experiences that could take place anywhere. The stories do share some common points. Except for the last story and the introductory passage of the novella, all are told in first person narrative, usually from a character who is on the outskirts of the story, observing the actions more as a bystander than a participant, and allowing us a detached viewpoint of the action. For instance, the novella centers around Shane, a troubled young man who is quiet and withdrawn – for reasons that are obvious shortly into the story – and is told by his cousin Colleen. A universal trait of each story in Make It Right is the tragedy of life. Readers looking for happy endings or moments of joy will not find them within these pages. Yet for all their bleakness – including some truly unsettling scenes – they are presented with an elegance and grace that is riveting. 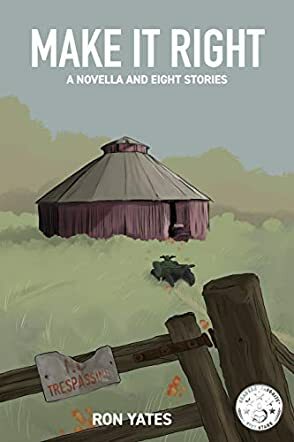 Ron Yates is a gifted writer, speaking with an eloquence that transforms these tragic and often depressing stories into another realm, where the reader can sit back and enjoy the beauty of the descriptions and marvel at the nuances presented in the telling. I did find that many of the stories seemed to end too soon. This was obviously the intent, to leave the reader wondering what happens next and drawing his own conclusions from the information presented. Not an easy read due to its subject matter, this collection of stories is entertaining nonetheless and shows off the writing skills of a tremendous author. With each story in Make It Right, Ron Yates gives us characters who are so devastatingly human, that at times the stories were difficult to get through. However, the pay off at the end was always worth it. My favorites in this collection were "Make It Right," "Spooky House," "Boiler Room" and "Shadow of Death." Each story is filled with flawed characters, choices both made and unmade, with consequences that inevitably reveal some of our darkest human truths. The writing is direct and deceivingly simple, and yet the world Yates creates here is tragic, beautiful and so heart-breakingly real. I thoroughly enjoyed reading this.